Hello. I'm back, after quite a while of staying silent. My name is Dr. Arvus Kline--Arvie to my friends. Those friends include Carrie Kennersly, whose adventures are now being memorialized in the Barkery & Biscuits Mysteries. And that's what I want to talk about. I'm a doctor of veterinary medicine, head vet at the Knobcone Heights Veterinary Clinic and Carrie's boss for her part-time job here as a veterinary technician. I really like Carrie and encouraged her to open her bakeries here in town: Icing on the Cake, which sells delicious baked treats for people, and, delightfully, Barkery and Biscuits, the bakery next door where Carrie sells healthy treats for dogs that she mostly developed while working for our clinic. It's Carrie's unofficial avocation that worries me. There have been quite a few murders here lately in Knobcone Heights, and Carrie has been much too involved in solving them. Oh, I understood it the first time, since she was the major suspect. But since then there have been several more, and since some of her friends had become suspects then she had to step in and solve those, too. And I have to say, I'm glad she did so the last time since the suspects included me--and the main suspect was Dr. Reed Storme, one of the best vets here at my clinic, as well as a close friend, and more, of Carrie's. What happened then was memorialized in Bad to the Bone. But it's a new year now. That should be enough... and yet I hear rumors that there are more to come... Well, as long as Carrie can continue to do her jobs--all of them--and stay safe herself, I'm not going to complain. But I will worry. 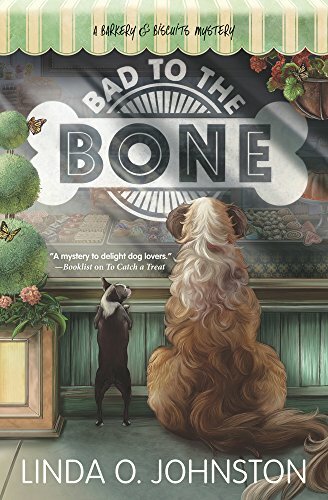 BAD TO THE BONE, the third Barkery & Biscuits Mystery by Linda O. Johnston, was a May 2017 release from Midnight Ink. And watch for PICK AND CHEWS, coming in May 2018. Can't wait for the adventures to continue with PICK AND CHEWS! Thanks, Kay--although I believe I might actually be a suspect myself in that story.